Every Thai property — be it a humble hut or a giant mansion, a bank, a disco, a brothel, a farm, or even a rubber plantation up in the mountains — has a Spirit House somewhere on the compound. The Thais are an incredibly devout and superstitious people, and big believers in not only good and bad spirits but also ghosts. A Spirit House, as the name implies, provides a place for these spirits to stay, and people give offerings, usually in the form of food (fruit, bowl of rice, etc), a drink (often alcoholic), and light some incense. Spirit houses are everywhere, and a property without one is very bad joss indeed. This is precisely why I was so surprised the other day to come across what looked like a Spirit House Graveyard. 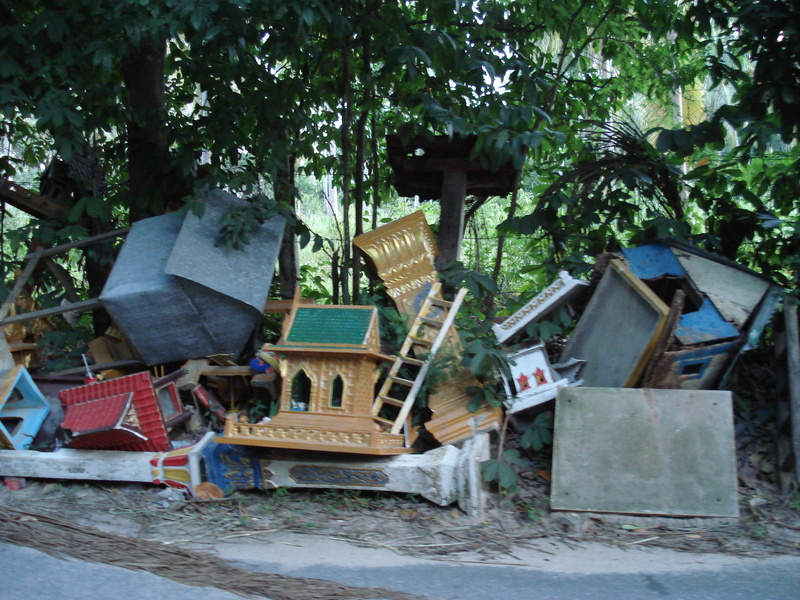 Right behind the Samui International Airport is a road that runs straight for a few minutes, and all along one side of the road there are hundreds of spirit houses that appear to have been unceremoniously dumped and left to rot. Well, when in Rome, I guess. I thought that tossing away a spirit house like that would be the equivalent to throwing away a crucifix or your country’s flag or something like that but it seems to be no big deal. But I suppose there are so many things about Thai culture that an outsider would not understand, unless perhaps you live here for a long time. Each country has such different rules about what is acceptable and what is a big no-no. The trick, I suppose, is to keep not only your eyes and ears open, but also your mind. Thoughtful posting. It has been over 40 years since I had a class in “Philosophy of Religion” which included the belief in “ghosts”. It is wonderful to take the time to study the country you are in to fully understand what is behind the people’s feelings and their culture. You have been blessed with the opportunity to have traveled and observed and understand those customs. Eileen says it all.She understands how astute you are. Very observant, you and her. I personally love learning about the different religions/beliefs, especially in Asia. But with the language barrier it is pretty hard to figure out what is going on! Lovely to meet you Suzanne. We had a hard time saying “Good bye” to your daughter when she came to Alaska. I have to give her so much credit…the language barrier does make it hard. Are you studying up in advance for your next adventure with your hubby?We talked with our son and his wife, and she is following what you are up to, also. Keep showing us your adventures.